The warehouse at the corner of Olive and Wallace in downtown Bozeman was originally built in 1929 by the Chicago, Milwaukee, St. Paul & Pacific Railway Co. In 2013 Olive and Wallace, LLC remodeled the dilapidated warehouse into a contemporary commercial space based on principles of modern functionality. 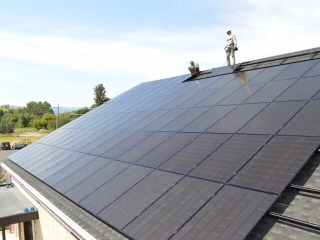 Focused on sustainability and motivated by the prospect of lowering the operating costs of their commercial investment property, the owners installed high-efficiency mechanical systems, new insulation, a high R-value SIPS panel roof, and this 30 kW solar array to offset the electrical load of the building. Click here to watch Grizzly Creek Films' video on the renovation project at the historic Olive and Wallace building. 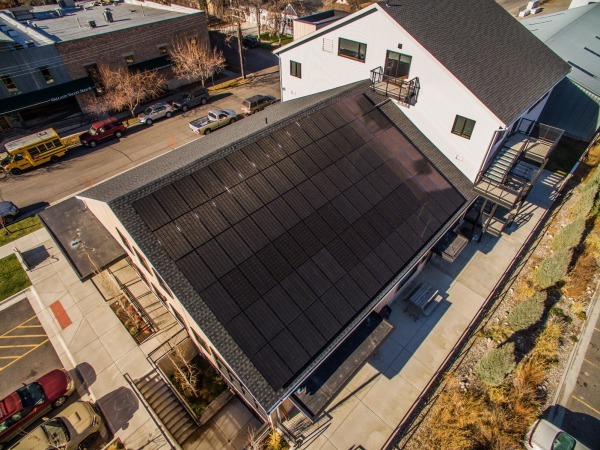 Despite the solar array facing east, which reduces it's energy output by approximately 20%, the roof of the Olive and Wallace building fits this 30 kW solar array perfectly. Mechanically, the array consists of 96 all-black monocrystalline solar modules configured in 6 even rows of 16. 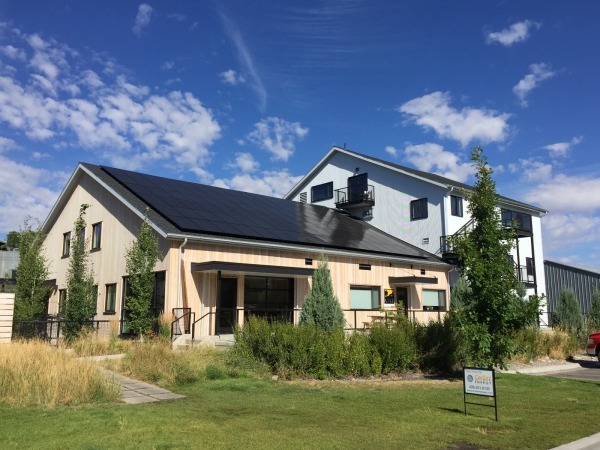 Electrically, the array is divided into three separate inverter systems to feed three individually-metered units in the building, which house Grizzly Creek Films, Gallatin Valley Land Trust, and Wildlife Conservation Society. Online data-monitoring of the inverters allows easy insight to the performance of the system for the owners. The system will produce an estimated 30280 kWh per year and will offset 100% of the current electrical demand of the aforementioned companies. With the assistance of a 30% tax credit, an accelerated corporate depreciation schedule, and a 25% grant from the USDA, financial payback on the system is estimated at 7 years. The 25 year energy production of the system is equivalent to offsetting carbon emissions from 534,914 lbs of burned coal, offsetting greenhouse gas emissions from 106 passenger vehicles driven in a year, and offsetting greenhouse gas emissions from 159 tons of waste dumped in a landfill. We were first hired for system design consultation in 2012 during the architectural design period of the project, as the electrical distribution of the system to the three intended commercial suites had to be pre-engineered accordingly. In addition, the conduits and circuitry had to be installed during the electrical rough-in period of the renovation. Estimating electrical load ranges of the tenants, and matching solar system energy production accordingly was a careful process. 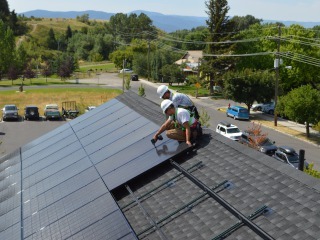 During the construction of the solar array, our install team was faced with building a square and planar solar array on a roof that showed nearly 100 years of 'character'. We were also faced with attaching the solar racking system to horizontal purlins located beneath SIPS paneling some 10" below the roof surface. This required multiple adaptive methods and a varied assortment of hardware. As the purlins are located in an open space above two of the commercial units, the attachment work was completed on a Saturday so as not to disturb the tenant workspaces during business hours. 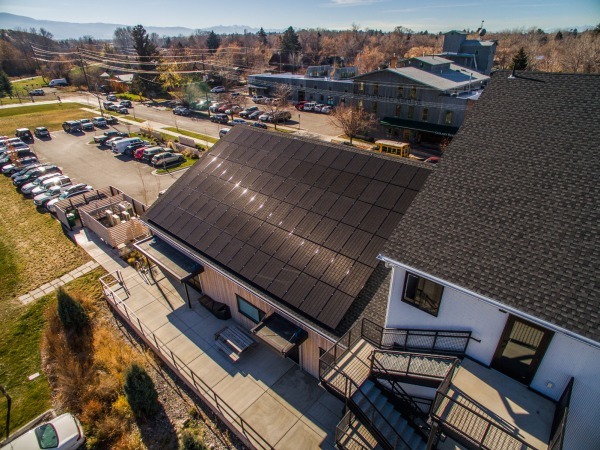 The result was a clean installation that enhanced the aesthetics of an already beautiful building in a vibrant corner of downtown Bozeman!